Fetal Alcohol Spectrum Disorder (FASD) is a complex condition that can involve a wide range of issues including, but not limited to, cognitive disability; it is also a highly stigmatized, and lifelong condition. 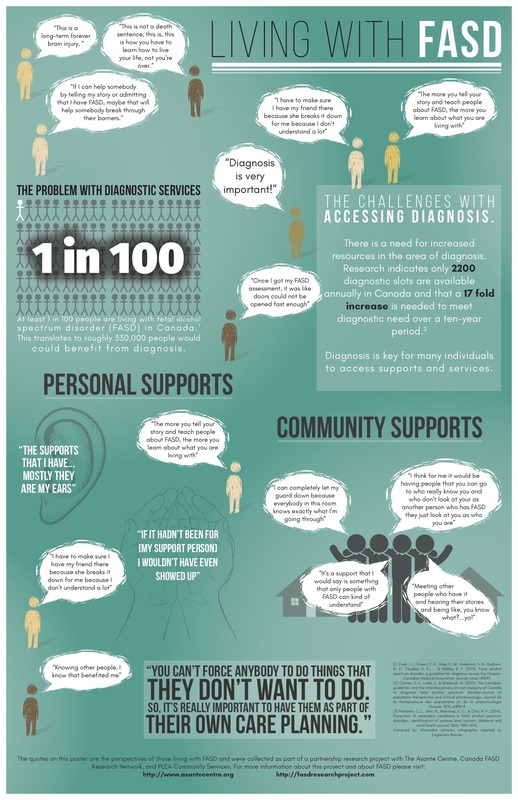 Frontline professionals working in the health and community support sector as well as social work and probation services report challenges in raising the question of diagnosis as well as concerns about how diagnosis is discussed with clients. Concurrently, individuals living with FASD need to know that they are not alone when facing the diagnosis, the challenges of the condition, and subsequent confusion that can arise with diagnosis and related health challenges and potential stigma that is associated to the condition. This community-driven and community-based research project teams together frontline workers and support agencies who have a research need with the methodological background of a researcher, students and research network. The outcome will be a series of focus groups that will place attention on the lived experiences of those who have FASD and are effectively experts who can offer guidance and insight on these challenging issues. Much like autism, individuals with FASD live life on a spectrum, accordingly one person’s story of their diagnosis is unique but lends itself to learning about the challenges they faced along with successes they experienced. Using group and individual interviews, the project focuses on the lived experience of those with FASD and asks them to share with us their experience of learning about their diagnosis and some of the practices that did and did not work in helping them to establish a relationship to their diagnosis alongside areas for improvement as it relates to diagnosis and navigating systems (health, social services, education, justice, etc.). This information will can have significant impacts including the improvement in the area of delivery of services. Specifically, this information will be mobilized into recommendations for changes in practices and policies which could include diagnosticians and support staff (at the Asante Centre), youth workers (at PLEA Community Services of BC [PLEA]) as well as parents, advocates and researchers (through Canada FASD Research Network [CanFASD]). This research will demonstrate a team approach to research through a partnerships committed to Participatory Action Research in which individuals with FASD will be asked to help directly impact practices; the project will be predicated on strength-based approach to FASD research with a focus on resiliency and capacity building in the community. The project is part of a partnership between Asante Centre, PLEA and CanFASD, each of which are agencies that are engaged in work in the field of FASD whether as sites of support, diagnosis and/or research. Keep an eye out for additional research findings that will be released in late 2017.